← Still Another Unsung Hero of the American Revolution! Just when you thought there were no more surprises! The King of Spain should be remembered for his contribution to the American cause, without which we might have faltered! Carlos, King of Spain: Former king of Naples and Sicily and former duke of Parma and Piacenza; born Catholic into the House of Bourbon, the same family as King Louis XVI of France. 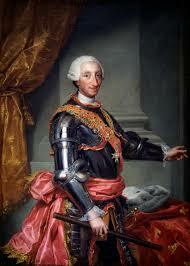 He married Maria Amalia of Saxony, ascended to the throne of Spain in 1759, and reigned until his death in 1788. King Carlos did not fully support American independence since he thought it might ignite an uprising in his own country, but he tolerated and supported covert aid beginning in 1776. After declaring war on Britain in 1779 he continued to aid the American cause in indirect ways while at the same time meeting Spain’s goals. At the request of Rochambeau and La Luzerne, De Grasse assembled the funds needed for the siege of Yorktown from Carlos’s subjects in Havana, Cuba. Spain and its Generals on both sides of the Atlantic were most helpful in sending supplies to the insurgents in Massachusetts and in the Louisiana area as well. Spain has not received due credit for all it did to aid the UIS. I am making sure my readers are aware of their contribution.